The thing with hiking shoes is, that they are generally large and lump. And very heavy. As a result, I usually find myself wearing them on a flight because they are too have to put in my checked luggage, which is in fact a typical Dutch thing to do. I hate wearing my hiking shoes on a flight so when the Lowa Lady Light GTX’s are delivered, I’m instantly happy about the weight of them! I can easily put those in my checked luggage as they are a lot lighter than my similar hiking shoes. The actual plan was to hike the whole trail on my lower hiking shoes, but after seriously injuring my ankle last summer and taking quite a while to recover, I realized I needed ankle high shoes to safely make it through this 15-day trek. 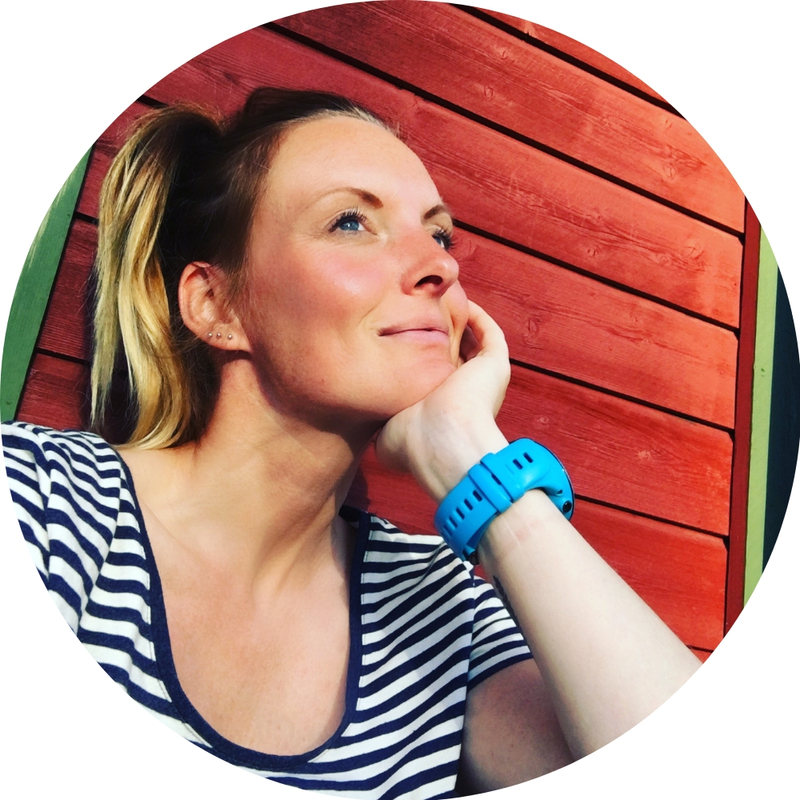 I wear them while hiking through the city park, take them with me across the Moselsteig in Germany and bring them along on my hiking trips to the Veluwe, the biggest natural area in The Netherlands. 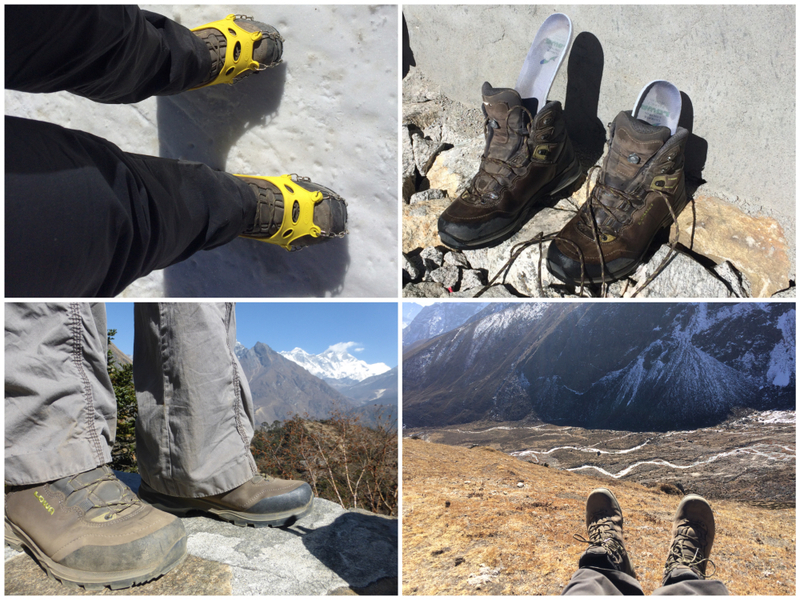 My new hiking shoes are ready to beat Everest Base Camp in Nepal! Everest Base Camp Trek is not difficult but it’s pretty exhausting. Not just because of the duration (our trek was 15 days) but also because of the altitude. Breathing in and out at more than 4.000 meters is a real challenge and at such a moment, you don’t really want to have sore feet as well. Although I was a little sceptic about blistering my feet with my relatively new shoes, I can proudly tell you that, even though I hiked 15 days in a row, I did not have one single blister! 1-0 for Lowa! When you arrive at the teahouses, the first thing you do is take off your hiking shoes, which are replaces by Crocs or other sandals while you’re indoors. In most cases, the second thing you do, is pull up your nose because of the horrid smell coming from your hiking boots, especially if you have been wearing the same socks for 5 days in a row. To really test the shoes, I had to put in my nose and smell them. Not something I was looking forward to but … it wasn’t as bad as I thought because, even after 15 days, all I smelled was still a little bit of novelty, while my socks actually smelled like … oh well, I think you guess. Something with uhm, cheese! 2-0 for Lowa! The most important thing I was testing the Lowa Lady GTX Light shoes on was of course the performance in mountainous terrain. Let’s face it, hiking through a city park is not exactly trekking through the Himalayas. This trek was going to be a real challenge for both me and the shoes. 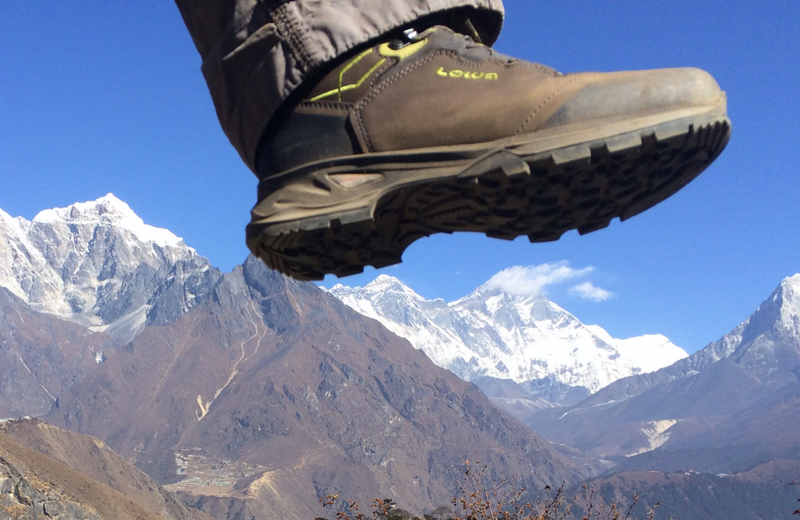 My previous experience with Lowa’s (my first pair of hiking shoes ever was Lowa as well!) is that their soles are relatively slippery. Maybe it’s just me, but since I wear Meindls I slip a lot less than with my previous pair of Lowa’s. I’ve been wearing those all around the planet but always found myself sliding down the hill when there was a lot of mud or scree. 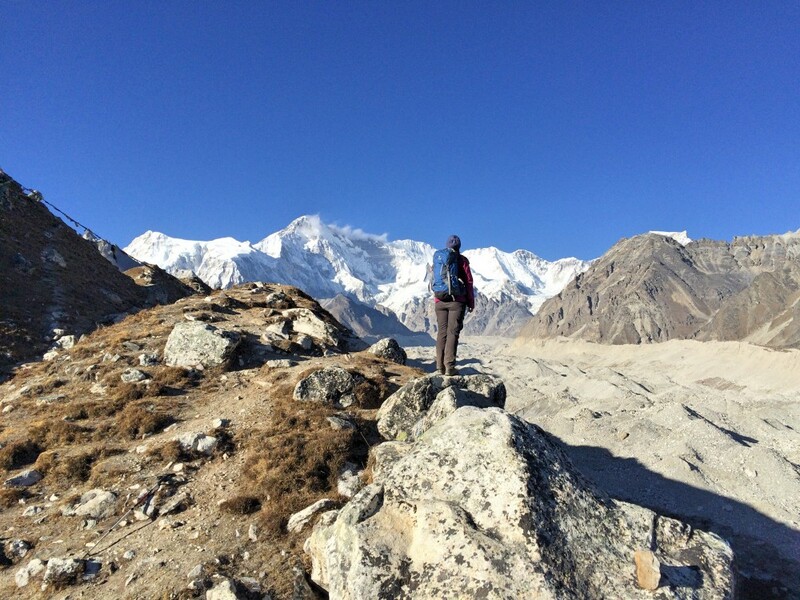 In Nepal we climbed 5.368 m. high Cho La Pass (according to Lonely Planet one of the most head-breaking mountain passes in Nepal), we crossed glaciers without even wearing crampons and hiked across frozen waterfalls. Only once I slipped and that was because the soles got clogged up with mud, so I had no more grip. Lukcily it was a soft landing. On the last day, I also slipped 4 times but that simply was because I was exhausted. So that’s 3-0 for Lowa! Update in November 2018: I’m still wearing these boots each time I head out on a multi-day hike. I used them again on my trek to Annapurna Base Camp as well as the Kungsleden in Sweden last summer. So they are definitely worth the investment! Disclaimer: this post contains affiliate links. In case you buy something through our website, we will earn a small commission without extra cost for you. Thanks for considering! Want to read more? You may also like these blogs! – Everest Base Camp Trek: the movie! Yes, we are still going to Nepal! 250 we12travel blogs: keep calm & blog on! Hmm interesting… I am looking for new hiking shoes and totally agree about them always being so heavy. That’s why for New Zealand I brought my old running shoes instead of hiking boots. But because I want to do some more serious (multiple day) tracks I think it would be smart to buy some quality shoes. I was thinking about going for the Lowa Renegade (but they are heavy) but I’ll definitely try these on when I go shopping tomorrow! Bring waterproof ones when you are going to NZ, they will not only keep your feet dry but also warm. I hope you found a great pair of shoes! Great review. I haven’t tried their hiking shoes but have the Renegades that work great in wet hiking environments (like the U.S.’s PNW). I really enjoy the lightness and was scared to try a new brand after having my other hiking boots for 8 years. It was time for a change and was happy with them. Nice pair of shoes; I’ve been using mine for going on 2 years now and am definitely up for a new pair very soon. I just checked and am happy to see they have this same shoe but for Men. Read through all the reviews and, like you, for the most part everyone raved about them! I just picked up a pair of these about a month ago. I’ve put in about 30 miles of high-altitude hiking (up 14,000+’ peaks in Colorado). They really didn’t need much break in. Feel very sturdy over scree and rock. I’m also headed to Nepal in March to do Gokyo Ri. So glad to see that they held up well in that environment! Tested them over some small snow/ice patches. They are AMAZING. I’ll be wearing them with microspikes for a more technical climb this weekend. I simply love these boots. I have a nerve problem in my foot that can be debilitating with the wrong pair of shoes and these guys have passed the test. Ahhh cool, I am sure you will love it! I bought some tiny spikes in Kathmandu for this trip (they call them plastic crampons) and they worked amazing on the glaciers. Happy to hear these passed the test for you, I know how it can be a pain to find some shoes that are a great fit … have an amazing time in Nepal!! !